Using Microsoft Pay, you will soon be able to pay bills or invoices directly in your Outlook inbox, without switching to another app or website. Microsoft securely stores your payment and billing information in a Microsoft vault. This feature will be rolling out to a limited number of Outlook.com users in the US and can initially only be used to pay invoices using Xero. In the coming months, it will become available more broadly and will support additional partner solutions. Outlook is not a bill payment service and Microsoft is not acting as a bill pay agent. Always make sure that the invoice was sent from an email address you know and trust. You might receive an invoice from an invoicing partner (for example, the sender's email address ends in @post.xero.com) or you might receive an invoice directly from the business itself (for example, the sender's email address is sales@wideworldimporters.com). You should enter your payment and billing information only if you're expecting an invoice from the business and you recognize the sender's email address. Make sure to carefully examine the invoice, expected amount, and other details before paying the invoice. In Outlook.com, select a message that contains an invoice. In the message window, select Review and pay. 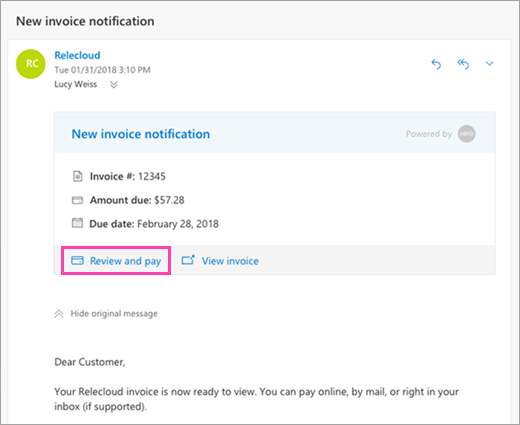 This will open a task pane in Outlook.com where you can view more details about the invoice including the due date, the amount due, and a link to the full invoice. Review the invoice details and select Continue. If this is your first time using Microsoft Pay, enter your payment and billing information and select Save and continue. If you've used Microsoft Pay before, review your billing details and select Continue. Note: Your payment and billing information is stored securely in an encrypted Microsoft vault. Outlook.com will remember your billing details the next time you make a payment. Re-enter your security code and then select Pay. 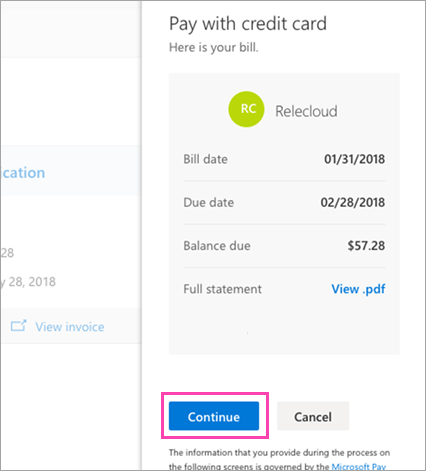 How do I get the payments in Outlook feature? The feature will begin rolling out to a limited number of Outlook.com customers in the US in May 2018, with a broader release in the following months. Initially, messages with an invoice will support payments using Xero. If you receive invoices from a merchant or business using Xero, you'll be able to make payments from your Outlook inbox. Which versions of Outlook support payments? The initial May 2018 release will be available to a limited number of Outlook.com customers in the US. In the following months, the feature will roll out more broadly to customers with Outlook.com or Office 365 email accounts using Outlook on the web or Outlook 2016 for Windows. Is it secure to make a payment in Outlook using Microsoft Pay? Outlook uses a multilayered approach to protect our customers. The new payment experience is restricted to invoices sent by merchants through our partner network. Merchants using these partner platforms undergo verification and compliance checks from our partners. Note: The initial release in May 2018 will only support invoice payments from Xero. Other partner solutions will roll out in the following months. The payment process is encrypted at rest and in transit to protect your payment information. At the time of payment, your credit card information will be encrypted so that only the payment processor has access to your credit card details. Microsoft will store an encrypted version of your credit card details using state of the art enterprise-level security infrastructure which meets Payment Card Industry Data Security Standards (PCI DSS) Level 1 certification. To mitigate spoofing, we allow only emails that have passed DomainKeys Identified Mail/Sender Policy Framework (DKIM/SPF) checks. Additionally, Office 365 customers with Advanced Threat Protection are protected against various email phishing scams as wells as email attachments that contain malware. You should only pay an invoice if you're expecting an invoice from the business and you recognize the sender's email address. Make sure to check the invoice, amount due, and other details carefully before paying. How does Outlook protect against phishing or spoofing scam? Every payment email in Outlook uses DKIM/SPF standards to mitigate against spoofing. If the DKIM/SPF checks fail, the Outlook payment request is discarded and no payment card is displayed in your inbox. If you see a payment card, make sure to check that you recognize the sender's email address and verify the invoice details before paying. Additionally, Office 365 customers with Advanced Threat Protection are protected against various email phishing scams as wells as email attachments that contain malware. Important: When paying a bill or invoice in Outlook, the entire payment process occurs in Outlook. You'll never need to go to another website. Please don't follow any links that take you to a website outside Outlook. How do I update or delete credit card information in Microsoft Pay? You can add, change, or delete credit card information associated with your Microsoft account. To learn more, see Add, update, or remove credit cards and other ways to pay. Who will charge my credit card when using payments in Outlook? Microsoft securely stores your payment and billing information in a Microsoft vault and passes that information to the invoice payment processor for the transaction. The payment processor, not Microsoft, will charge your credit card.